In my family, there are only two holiday meals where the menu absolutely, positively can’t be futzed with: Thanksgiving and New Year’s Day. With my mother doing less of the holiday cooking, Christmas has become somewhat free-form. The traditional dinner has evolved into brunch served family-style at my house. This year, the star was a lovely ham accompanied by piles and piles of bacon and served alongside a Tortilla Española. To tell the truth, I think the star this year may have been the piles and piles of bacon–we went through 3 pounds that day! This Christmas, I made my life a little easier by purchasing a HoneyBaked ham, and when the last slice of ham was eaten, I wrapped that lovely ham-bone and saved it for The Meal That Must Not Be Changed: New Year’s Day Dinner. 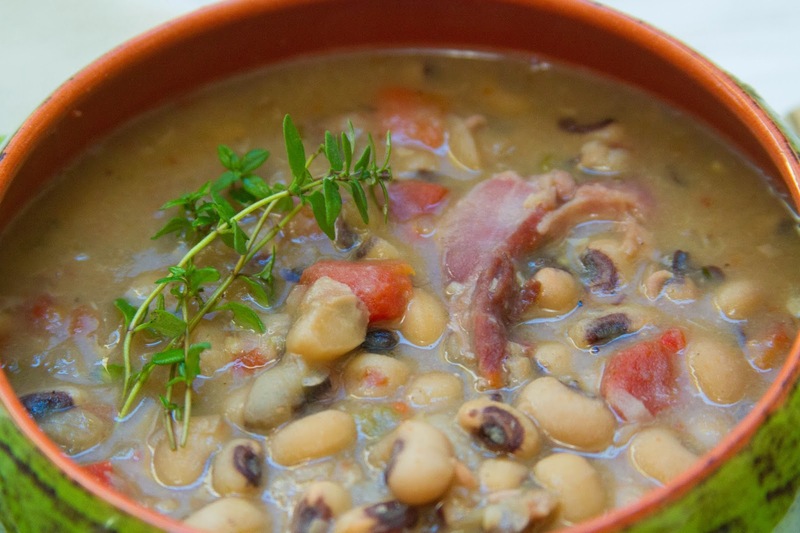 For as long as I remember, our family has eaten black-eyed peas and collard greens on New Year’s Day–those sweet and creamy peas cooked for hours with the Christmas ham-bone until the chunks of ham fall off the bone. Then there were the greens; a little bitter, a little spicy and braised with onions, garlic, chili flakes and vinegar. Until recently, I had believed this meal was a uniquely Southern ritual, but from the looks of my Facebook feed, it is enjoyed by so many people around the country! We eat the peas and collard greens because they are considered “lucky” foods: the peas symbolizing coins and the collard greens, paper money. 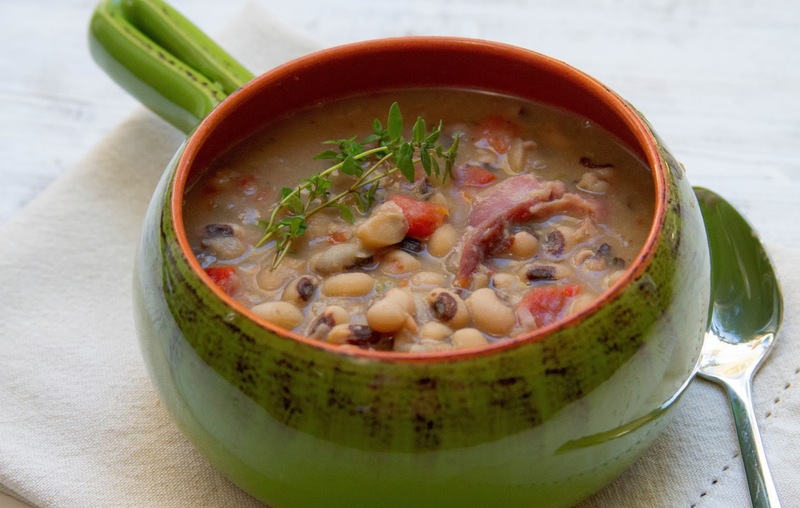 So, as my mom would say: if you want to have a New Year filled with lots of prosperity, eat lots of black-eyed peas and collard greens! 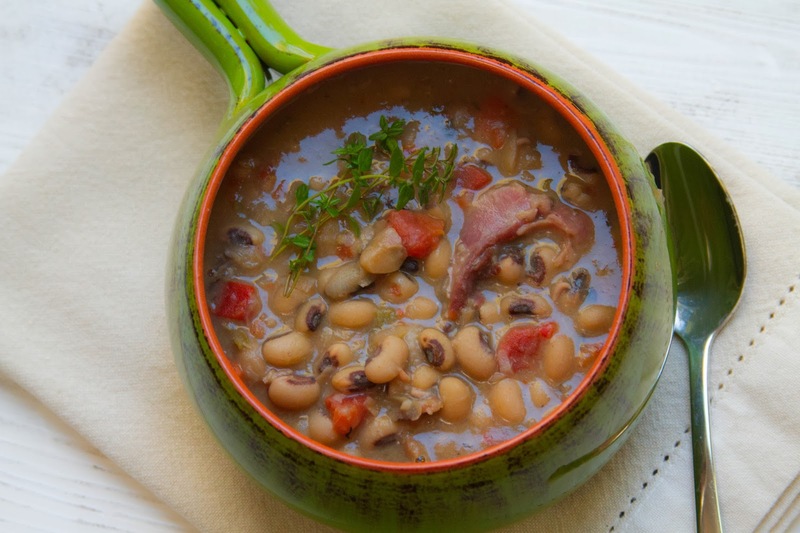 Now, I realize that I’m a week overdue with posting this recipe, but there is no reason black-eyed peas can’t be made throughout the year–maybe when you’re in need of a little bit of extra luck! 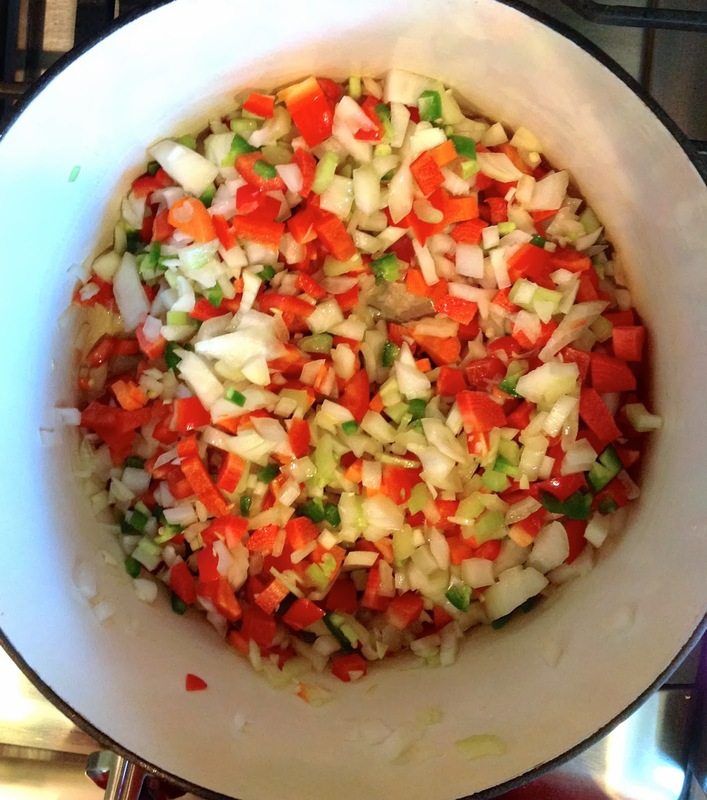 It’s as easy as making any soup–everything gets tossed into a big pot to simmer away for two hours while you watch football, or do whatever you feel like doing! 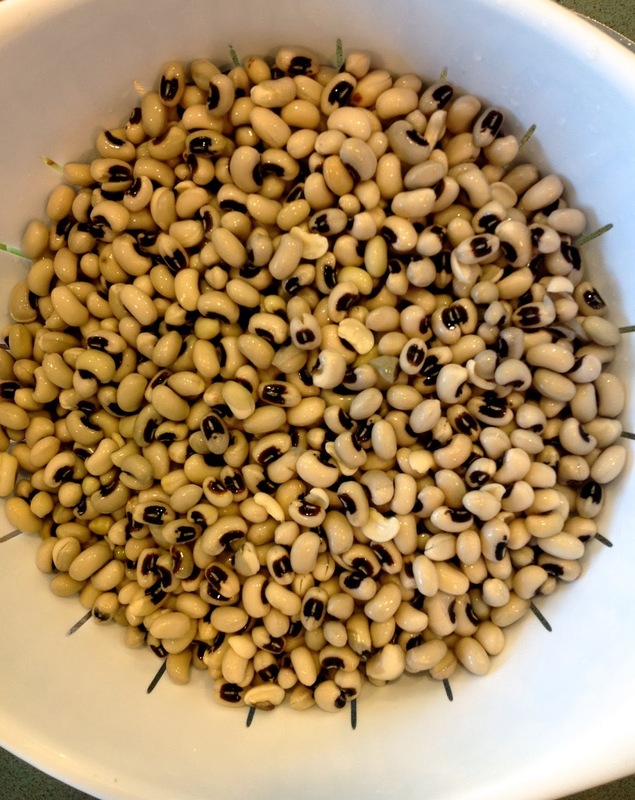 The day before making the peas, pick through them and remove any stones or other debris. Place the peas in a pot and cover them with water. Allow them to soak overnight. 1. Pour about 2 tablespoons of olive oil in a heavy bottomed pot. 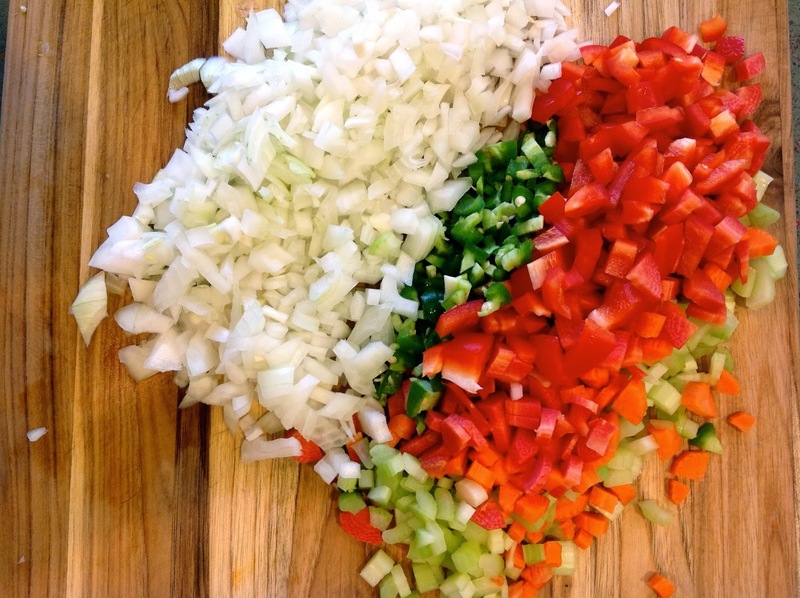 Add the vegetables and sauté for about 5 minutes, until they begin to soften. 2. 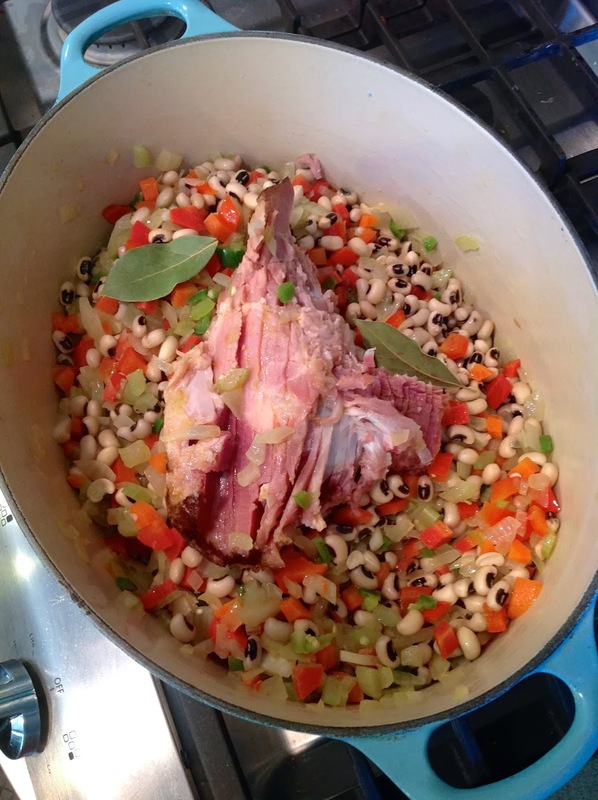 Add the ham bone to the pot, then the soaked peas. Add enough stock to completely cover the peas, then bring the pot to a boil. 3. After the peas come to a boil, turn the flame to the lowest setting, cover the pot and go do something else for a bit! 4. After the peas have cooked for about 2 hours, taste the broth and add additional seasoning as needed. I didn’t need to add any salt to the pot, because the ham provided salt and the stock was already salted. To make the peas creamy, my mother would smash some of the peas against the side of the pot with the back of a spoon. Stir to incorporate the smashed peas. Simmer for about 20 minutes more with the lid off. The peas will become thicker and creamier as they stand. Remove the ham bone pulling off any remaining meat and adding it to the pot, then discard the bone. Another little secret–my mother would always add a little sugar to the peas–maybe 1/2 teaspoon. This is totally optional, but lends a nice sweetness to the peas. I hope your 2014 so far has been filled with good luck!